Melita is one of numerous Manitoba towns that had its original location abandoned when a nearby site was chosen by a railway company. In this case the fledgling town of Melita had only a short way to travel. It is also one of dozens of towns that sprang up almost overnight when a railway station appeared in the middle of a well-populated farmland. The settlement of the Melita area began in 1879 with the arrival of a few settlers from Ontario who traveled along the Boundary Commission Trail. As the first settlers established themselves three identifiable communities developed. Sourisford, situated near the mouth the Antler Creek, soon had a post office and a store. A town site. Souris City (alternately, “Souriopolis”) was created at 26-2-27, which was briefly the location of the new Land Titles Office. Dobbyn City, a bit east of the current town at (32-3-26), was promoted by owner John Dobbyn, and lots were offered to speculators. 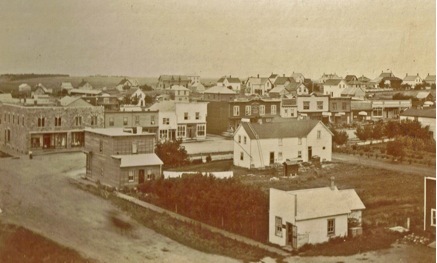 It was one of dozens of speculative townsites in Manitoba during the Manitoba Boom of 1881-82. Although the “City” was short-lived, a Post Office, called Menota, did offer some basic services to the region. It was Manchester, a rival town promoted by Dr. Sinclair, that went beyond the paper stage and evolved into Melita, first by undergoing a name change, and then by moving a short kilometre or two to be alongside the C.P.R when it finally arrived in 1891.
one of several businesses that moved to the new site of Melita. With very basic services in place the setters turned their attention to the business of establishing farms while the railway company just kept making promises. By the time the current town of Melita appeared in 1890, the region itself had a long and interesting history. So of the three identifiable communities developed within a few miles of the current site of Melita, Sourisford lives on as a location and a part of our heritage. Dobbyn City failed to materialize but the district of Menota, lives on as a school site and Manchester, renamed Melita endures as a commercial centre. Before the first train whistle sounded Mr. G.L.Dodds had moved his Hardware & General Store to the site of the new town and virtually everyone followed. 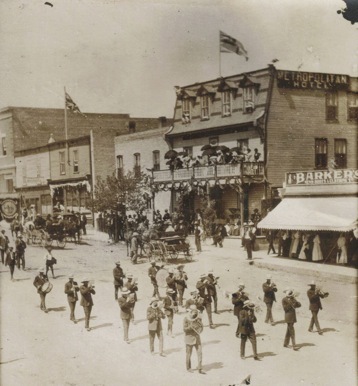 By 1892 numerous business blocks lined Main and Front Streets. An interesting item from an 1891 edition of the Melita Enterprise states that: “Most of the houses brought into Melita this year have found ready sale.” Quite a few of those early buildings, including a few commercial structures, made it into the modern era, and although one might not recognize them, both the former Morrow Pharmacy and the McMaster Insurance (Sears) Building date from that time. The current Presbyterian Church also dates from 1892. In the early years of the twentieth century Melita consolidated its position as the primary trading centre for the region while to the east, Napinka, and to the west, Pierson, also prospered. Nearby Elva, Coulter and Tilston remained smaller service centres. It was predictable that Melita would grow quickly and confidently in that that the vital rail link placed it at the centre of an already well-established agricultural base. There was no speculation or uncertainty about its importance as a service centre. Buildings were moved from the previous location just across the tracks or built quickly from readily materials readily available via the new rail line. Many of these building were substantial, but few survive today. Within a few years they were supplanted and replaced by more ambitious structures such as the Northern Bank, the I.O.O.F Hall and the Crerar Law Office; all of which continue to grace the Main Street. It was in that period that many fine homes were erected, of both frame and brick construction, some near the core area, but others on the perimeter. Owned by community leaders with names like Dobbyn, Duncan and Holden, several of these buildings have been well cared for and survive intact. As Melita looks forward to the century ahead it has taken steps to preserved important aspects of its past, including the preservation of the Melita School as of the Antler River Museum.